2018 marks the 50th anniversary of family-owned, local eatery Pisgah Fish Camp. This much-loved establishment was founded, owned and operated by the Hawkins family since 1968. 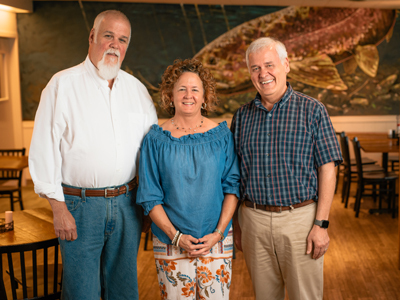 Currently co-owned by Dana Hawkins and his sister Jeanne, all four Hawkins siblings, including brothers Mike and Chris, have a history of involvement in the restaurant. The Hawkins family has never met a stranger. That’s an ethos patriarch and founder Dan Hawkins brought with him from his agricultural childhood in South Carolina, and carried through early retain management in Brevard. Dan liked bringing people together in spaces built for fun. He managed a local bowling alley and set it up with a restaurant. He built the area’s first Putt-Putt mini-golf course. He set his sights on an old cabin, former home of the Brevard Country Club, and had a notion that he might open a Fish Camp, imbued with the same easy-going friendliness and sense of fun as his previous recreational establishments. With Dan running the business with his wife Fran, the Fish Camp proved a hit. He found a new home for his restaurant on the site of an old dish barn at the intersection of highways 280 and 276 near the entrance to Pisgah National Forest. With a staff of friends and family, Pisgah Fish Camp became an unmissable destination for locals and tourists alike. Families celebrated milestones over platters of fried flounder. Visitors stumbled in off the trails to fortify themselves with hush puppies and sweet tea after a day in the forest. The kitchen cooked up to-go orders of fifty cheeseburgers and delivered them in boxes to the gates of the old Ecusta Paper Mill for some of the employees during lunch break. And each Labor Day, the Fish Camp would provide the fare for the Ecusta family picnic at the local Union Hall, serving up as many as 2000 meals in a single day. The familial spirit, the notion of we take care of our people, was put into stark relief in 1977, when the restaurant went up in flames late one night. The location was devastated, but the community rallied. Everyone chipped in, and Pisgah Fish Camp was able to reopen in only thirteen days. Brevard grew and changed over the years. An ever-increasing number of tourists and campers wandered through every summer. 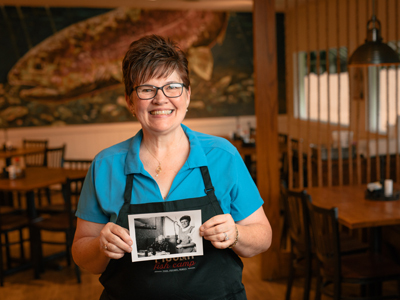 In the 70s and 80s, the family opened five new locations of Pisgah Fish Camp throughout the region, and each of the Hawkins children operated one or more of the restaurants. The family’s plans were ambitious, guided by Dan’s pragmatic optimism. By 1991, Dan set his sights on an old auto-body store just across the street. Pisgah Fish Camp closed in early October, just days after the peak leaf season, and the Hawkins family once again built out from barely more than a shell. Most of the laborers were friends, family and restaurant staff. Dana hauled lumber and drove nails. Cooks assisted the carpenters. Throughout the winter, the new space took shape. They reopened the Fish Camp at 4 p.m. the Wednesday before Mother’s Day in 1992, moments after receiving their new Certificate of Occupancy. And to that end, Mother’s Day of 1992 saw the largest crowd Pisgah Fish Camp ever served in their restaurant with over 800 patrons. The Hawkins family felt humbled and overwhelmed by the loyalty of their customers and their community. Today, Pisgah Fish Camp is still serving up platters of popcorn shrimp, crispy fried chicken, tasty burgers and fries, and a home-style buffet to happy families, long-time friends and sun-kissed travelers. 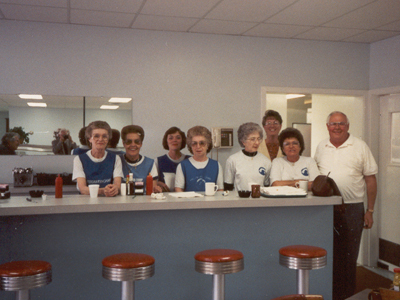 In 1992, shortly after opening at our current location we lined up the front of the house crew for a photo, l to r: Jo Stephens, Dotty Hamilton, Teresa Frady, Christine Newton, Nadine Thomas, Wanda Hawkins, Elaine Raines and Dan Hawkins. Debbie Martin is pictured holding a photograph of her mother Elaine Raines, a long-time employee. Debbie began working with us at the tender age of 14 and is still at it today. Open 7 days a week, 11 a.m. – 9 p.m.
Sunday through Thursday: 11 a.m. – 8 p.m.
Friday and Saturday: 11 a.m. – 9 p.m.